The third in the line of reincarnations, His Eminence the Venerable Tenzin Ngawang Tsültrim Dönden was born on January 29th, 1981 in India. At the time of His birth, He was named Tenzin Dawa by H.H. the 14th Dalai Lama. His father’s name is Tamding Dorjee and His mother’s name is Karma Kyizom.In 1985, He was recognized as the reincarnation of the second Serkong Dorjee Chang, in the sacred place of Bodhgaya, by H.H. the 14th Dalai Lama during the ceremony of the great initiation of Kalachakra, For the first time, He wore monk’s robes given to him by Gyumed’s ex-abbot Lobsang Thinley, who came from Gajang Phara Khangsten in Gaden Jangtse Monastery. H.H. the 14th Dalai Lama gave to the young Serkong Dorjee Chang His first hair cut’s blessing and a special nectar called Amrita blessing. When He was only 4 years old, He obtained the seat of “Tulku” or reincarnated Lama in Swayambhunath in Kathmandu, Nepal where the Serkong Dorjee Chang Monastery is located. There, He took refuge, studied Tibetan language and began memorizing the first Tibetan Buddhist texts. Five years later, at the age of 9, He obtained the seat of ’Tibetan Government Tulku’, or reincarnated Lama, in the Gaden Lachi Monastery in India, where He began His studies. He also received from H.H. the 14th Dalai Lama the vows of a novice monk and was given the name Tenzin Ngawang Tsültrim Dönden. When He was 13 years old, He studied Guyasamaja, Yamantaka, and Chakrasamvara Tantra, memorizing the entire texts. He also learned chants, mudra, and Tibetan prayers. At the age of 19, He received the vows of full ordinated monk by H.H. the 14th Dalai Lama. He also received and studied many Sutra commentaries and transmissions as well as Tantric empowerments and initiations. From the age of 14 until 32, He correctly followed His spiritual teachers with both thoughts and actions. He studied and perfected His knowledge on the Collected Topics (text on Tibetan Buddhist debating), Valid Cognitions, the Perfection of Wisdom, the Middle Way, Abhidharma and Vinaya. When Rinpoche was 32 years old, He received the ’Rab Jampa’ Geshe degree on Sunday, October 10th, 2010 at 10:10 am at Gaden Jangste Monastic University in India. In December 2013, Rinpoche completed His philosophical studies with the rites and rituals of Tantric path at the Gyudmed Tantric Monastery. He has been traveling to Nepal, India, Bhutan, Mön (in northeast India), Europe and the United States giving Buddhist teachings and benefiting sentient beings. He looks after His own Monastery in Swayambunath, Nepal, the Serkong Dorjee Chang Monastery, taking care of the building and it’s residents. This concludes a brief presentation of the life stories of the successive reincarnations. Written by Serkong Dorjee Chang Rinpoche’s resident attendants. 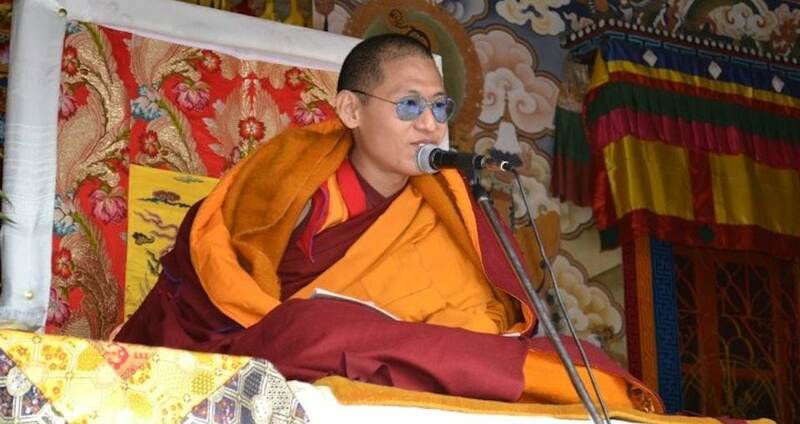 The second in the line of reincarnations, His Eminence the Venerable Thubten Tse Wang was born in the Tibetan calendar year 2047, the iron monkey year of the 15th cycle, corresponding to 1921 in the western calendar, in front of the Lhasa Cathedral, in the house of ‘do kor chu mig’. When he reached the age of ten he obtained the seat of a great Lama in the great assembly of the monastery of Gaden. He received the vows of novice and fully ordained monk from His Holiness the Thirteenth Dalai Lama and was given the name Thubten Tse Wang. He studied at the feet of many highly qualified tutors and exerted himself in the mastery of the great treatises of Sutra and Tantra. At the age of 26, he received in Lhasa the title of ‘Rab Jiam’ and went to the Gyudmed Monastery where he attended many teachings on Sutra and Tantra and put them into practice. As a sign of having practiced Tantra continuously during his lifetime, on the firm basis of training in the common path, his body did not become dirty and did not sweat which was an undisputed display of reaching the stage of a ‘non-returner’. He bore the responsibility for the welfare of the teachings and of sentient beings in Tibet, Bhutan, Mon (in north India), India and Nepal. Moreover, he took care of his own monastery, the ‘Gaden Jiam Gön Lin’ Serkong monastery, the building as well as its residents, that is situated in Nepal, near the Swayambhunath Stupa. He passed away while residing there, in the rooms of his monastic residence, in the Tibetan calendar year 2106, the earth sheep of the 16th year cycle, the 18th day of the 9th Tibetan month corresponding to November 1979 of the western calendar, in the following way: even though he did not usually keep all the thankas (religious paintings) in his room formally displayed on the day of his passing away he gave orders to display them all accurately, donned his robes and lay down in the Lion posture of the parinirvana of the Blessed One, thus manifesting the absorption of his form body into the Dharma sphere. The first in the line of reincarnations, His Eminence the Venerable Ngag Wang Tsül Trim Dön Den was born as a member of the Yutok family, the family of origin of the 10th Dalai Lama, in the Tibetan calendar year 1982, in the wood rabbit year of the 14th cycle, corresponding to 1855 in the western calendar. His father and mother gave him the name Keu Yeshe Phel Bar.When he was 10 years old he received the monastic vows from the Great Throne Holder Ngag Wang Norbu and was given by him the name of Ngag Wagn Tsül Trim Dön Den. It was ascertained that he was the emanation of Venerable Marpa the Translator and he entered the Jangtse monastic college to begin his Dharma studies. When his root spiritual master, the supreme precious Great Throne Holder fell ill he nursed and served and him regardless of whether pleasing or disgusting tasks were involved and with this created the auspicious conditions for the attainment of a highly accomplished state in that same lifetime. He attended teachings and studied with great diligence and perseverance Sutra, Tantra and cultural subjects at the feet of many spiritual teachers, chief among them the aforementioned supreme Great Throne Holder. At the age of twenty-four he obtained the highest title of scholarship ‘Rab Jiam Pa’ during the Great Prayer Festival examinations in Lhasa and became famous for his erudition and wisdom. He then entered the Gyudmed Monastery and studied and practiced Tantras such as those of Guhyasamaja, Chakrasamvara and Yamantaka. At that time the supreme Great Throne Holder gave him strict orders to give back his vows of novice and fully ordained monk and urged him to practice Tantra, taking into account many goals and purposes, such as the lengthening of his lifespan, the improvement of his practice and the realization of the welfare of the teachings and of sentient beings. He followed his orders, donned lay robes and went to practice in solitary retreat in the most suitable way, without even the smallest attachment to the eight worldly dharmas. Content with poor food and ragged clothes he practiced Tantra day and night and manifested signs of realizations according to the principles of Tantra. This is explained in detail in his life story. When he went for an audience with His Holiness the thirteenth Dalai Lama in his rooms he saw the Great Thirteenth reincarnation in the aspect of Avalokiteshvara whose mind rests in its natural state. He furthered greatly the benefit of the teachings and of sentient beings in Tibet, Bhutan and Mon (in north India). At the age of 64, he was invited to Tashi Lhunpo by the ninth Panchen Lama, Lobsang Thubten Chökyi Nyima, consecrated a statue of Maitreya and gave many teachings to great assemblies of disciples. Lastly in the western calendar year of 1918, the Tibetan year of 2045, the earth horse year of the 15th cycle, on the 10th day of the 12th Tibetan month, he manifested the merging of his mind into the sphere of dharma.